Last month the first official photo from the set of Fast & Furious 6 surfaced with Vin Diesel, Paul Walker and director Justin Lin having a good ole time. Now some new photos from the film get a little more intense. Though we're not sure of the context within the film, it looks like Dwayne Johnson has found Walker and Diesel in their hideout for an old fashioned face-off. Meanwhile, another photo has Diesel looking vaguely annoyed as he gets into some sort of muscle car. With a new villain the form of Luke Evans overseas, is there a chance Johnson might have to team up with the fast-driving thieves? We'll see. 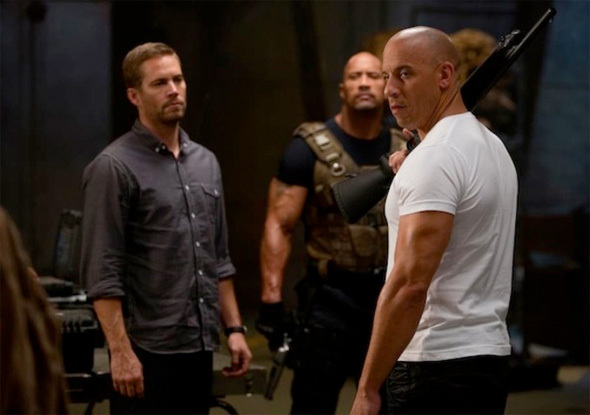 Fast and the Furious 6, shooting now under the direction of Justin Lin (Annapolis, Tokyo Drift, Fast & Furious, Fast Five), will follow-up Fast Five and will apparently focus on Paul Walker and Vin Diesel's crew heading to London with Dwayne Johnson and his team hot on their trail. It looks like Gina Carano is one of the latest to join Johnson's side of the fight. We don't know much else about it, but the cast features quite a few big names besides Johnson, Carano, Paul Walker and Vin Diesel. Justin Lin has cast Luke Evans and The Raid star Joe Taslim in this as well. Since shooting is just underway in London now, we'll have to wait to see more. Universal already has the still-untitled Fast Six set for release May 24th, 2013 next summer. The Rock is doing his THE RUNDOWN face. Yes. Oh man all The Fast & Furious films are always fun to watch. Mostly underrated too in terms of critics (ie It's not a Citizen Cane and other crap). I am most def looking forward to the badassery of this film and I'm glad The Rock is back. Maybe for Fast and Furious 7 Canada as the setting? It would be nice to see a race up north that could be exciting. DAMNN.....Dwayne is just too big, i wish i was like him. Just imagine walking down the street no one would wanna mess with a guy like that. Dwayne Johnson would be awesome as God of War. I could have sworn the second pic was from Fast Five.. It's pretty safe to say that this will be more of the same..
As long as it sticks to fast fives formula of non stop action first, story second then Im down...Fast five was easily the best of the series in my opinion.